AXO design modular Systems and shredding plants that process material efficiently, require a minimum of labour input and are ultimately profitable for our customers. We offer systems and layouts that have already proven their effectiveness all over the world. From fully integrated conveyor, shredder & baler systems to one off specific designs AXO offer a full plant design service. We can outsource specialist equipment and coordinate & fully install your new plant system. Our factory trained engineers are available 24/7 to keep your equipment operating at optimum efficiency. No matter what country or location AXO can manage your project in house with our worldwide team of experienced Project Managers. 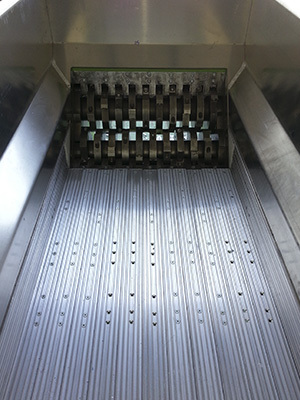 AXO's Level-Feed is designed to fit the entry of the Fatso shredder chamber and enables operators to bulk load the hopper without constant bridging. Because of this, the Level-Feed significantly improves throughput (kg/lb per hour). The operator also frees up time to do other chores while the Level-Feed meter feeds the paper into the shredder. The Level-Feed is run from, and controlled by the Fatso Inverter drives. Energy consumption of the Level-Feed itself is less than 0.5kW. The Level-Feed also reduces power consumption per Kg of the shredder by up to 25% depending on what type of paper is being shredded. 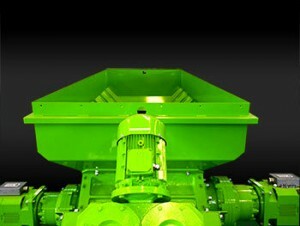 Safety is also enhanced by the Level-Feed because operators don't need to clear bridging jams in the shredder chamber. The Level-Feed base and sides, are flat, non-hazardous surfaces and there are no rollers or side-seals which are common to traditional conveyors. In short: Adding a Level-Feed reduces your labour and electrical bills, and improves safety. Since 2004 AXO have produced Bin-Lifters formerly known as the "K-Lift" in both Shred-Trucks and Collection-Trucks. 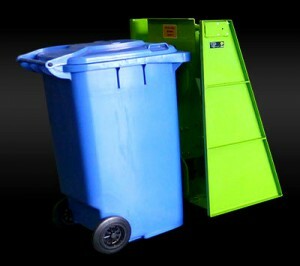 The Bin-Lifter design can handle UK/Europe bins 12/140/240/360 litre and North American bins 32/48/64 and 96 gallon. Many parts fabricated from aluminium to reduce weight and paint wear. Angled posts which can either direct bins and carts further into the hopper area, or in the case of Shred-Trucks bring the bins within the box body before the tip rotation. Composite bearings and housings reducing maintenance and increasing life. The standard AXO Bin-Lifter is now a harmonised design between UK/Europe and North American Shred-Trucks.